Hello loves, hope you are all doing well! I recently went on a trip to Tennessee with a bunch of other college students, and it was one of the best experiences I have ever had! I have been itching to travel, explore new places, and do new things out of my comfort zone, so when I saw this trip as an option on the website of my university's outdoor recreation center, I decided right then and there that I had to do it. The trip involved a ten hour roadtrip in a van, camping in 30 degree weather, hiking, camping, rock climbing, and bouldering! Seeing as I had never done any of those, except for riding in a car for ten hours, I thought this would be a great way to ease myself into traveling "semi-solo" (aka without my family). My goal for the trip was to learn these new skills and push myself to venture out of my comfort zone... I did achieve these things, but I what I also got out of it was some amazing new friends, a new perspective on the world and nature, and a deeper understanding of how strong and capable I really am. It sounds cheesy, but to be honest, I'm a really cheesy person anyways. Tennessee changed me for the better, and I am beyond grateful for all the experiences I had through this adventure. Beautiful people, beautiful views, and a beautiful outlook. Where should I go next? Hope you all have a wonderfully fabulous day! Happy 2018! I've been wanting to blog again after taking about a six month break, and the start of the new year seems like the best time to get back into it. To be honest, I was very ready to say goodbye to 2017 and ring in the New Year. This past year has been rich with valuable learning experiences and lessons, and I am so grateful to be able to grow and discover my values and passions. In today's post, I wanted to share my top three New Years Resolutions for 2018. Hopefully they will serve as inspiration or motivation for you guys as well! 1.) Always act with honesty and integrity. 2.) Live with an attitude of gratitude. 3.) Make self care and self compassion a priority. These are very simple resolutions, and my reasoning for that is because you cannot serve others from an empty cup. My theme for this year is "back to basics." I have learned that if you do not take time to take care of yourself, know yourself/ your values, and be thankful for what you have already, you cannot give yourself to others and achieve higher goals. As long as I live these three resolutions every day, I know I am on the right track. I feel that a lot of people make resolutions that are unrealistic, and while it is good to be bold and take risks and go for your biggest dreams, you have to start small and build a strong foundation within yourself. You cannot expect to be CEO if you do not take care of yourself. How can you expect to effectively run a business from a hospital bed? Nothing is impossible and life happens, but I know from personal experience that if you do not focus on your own health and well being first, then the outcome of everything else in your life will not be the quality you want. Anyways, there's my little bit for the start of the new year! I hope you enjoyed reading. Remember: resolutions are different than goals. A resolution is an intention you set or a course of action you decide on, while a goal is a specific result or end-point that you want to reach. I have a WHOLE BUNCH of goals I want to accomplish this year and I am thrilled to begin checking off that list! 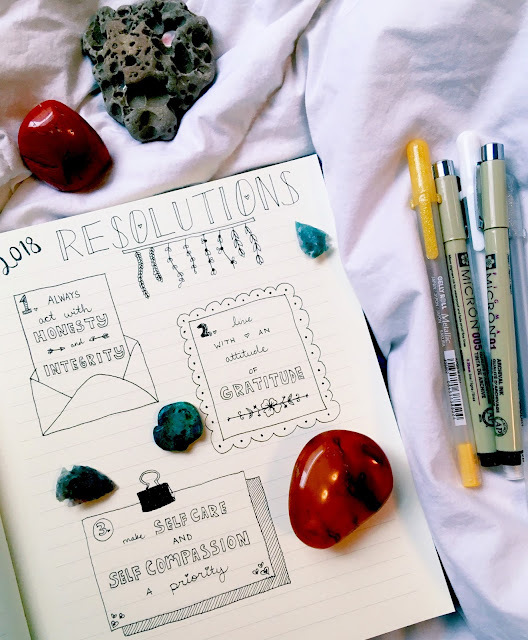 Feel free to share your resolutions and/or goals in the comments so we can hold each other accountable! Hope you all have a fabulous New Year and look forward to some fresh posts coming soon! For more "life" posts, click here!